Health and Beauty Girl : Aging and Makeup: Beauty Tips, Tricks and Products That Work! Aging and Makeup: Beauty Tips, Tricks and Products That Work! This post was written with us older gals in mind, but after I finished writing out all the tips, I realize that these tips can apply to anyone, young or old and everyone in between. I may not be a makeup artist, but I've played around with makeup long enough to learn a trick or two. I hope you find some helpful tips here! As I age I find that I prefer a lighter look with my makeup. I find it much more flattering than caking on all kinds of makeup- not that I ever like that look on me, but the point is that I find less is more as I'm aging. 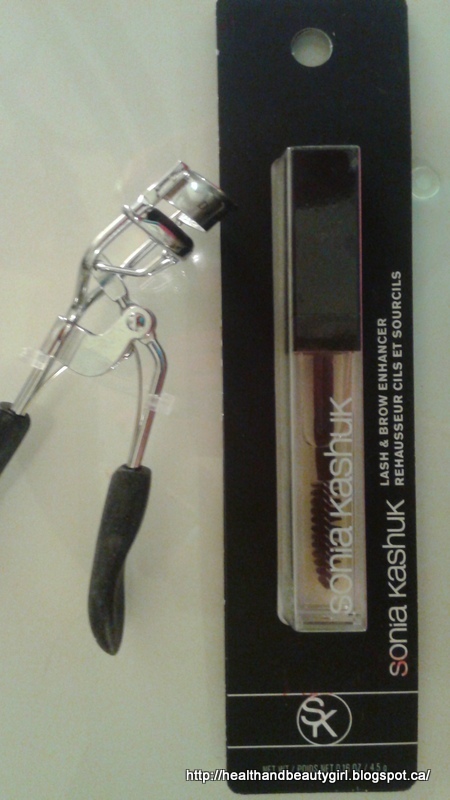 I use a lighter hand and I also lighten up with the colours that I wear for what I find is a more youthful look. Here, I share some of the ways I like to lighten up my makeup look as I've gotten older... I'll also add pictures of some of my favourite products. First and foremost, make sure your that your skin, lips and eyes are hydrated! You want a nice smooth canvass for your makeup and hydration makes everything plump up and plump = healthy and youthful. I feel the most important aspect of makeup for me is to add colour and brightness to my face. As we age we can lose colour and brightness in our faces that we had naturally when we were younger. I always use a big fluffy brush and add colour to my face, starting with an all-over dusting of bronzer after I've powdered. I apply to my forehead, cheeks, nose and jawline. I tend to prefer matte bronzers for the winter and for everyday looks and will use bronzers with a glow in the summer when it looks more natural. Don't get me wrong, I'm not ALL about rules, if I'm in the mood for a glowy bronzer at any time of year, I'll go for it! I also prefer bronzer with a more neutral or red undertone, I find it looks more natural on me since I get a little bit red when I get a natural tan. And, that's what I'm going for- a natural, healthy look with some colour in my face. Contouring: I know that contouring is a big thing these days and I remember loving that look on me when I was in high school, back when I still had the baby fat in my cheeks. Now that I don't have the baby fat in my face I don't really want to make my face look more gaunt, I want that youthful plumpness so I don't contour my cheeks. However, I do contour my nose, forehead and jawline! For older gals, I find that contouring the cheeks can be aging so I just avoid it. I can enjoy other trends and looks, one's that suit me and make me look more youthful, then, I'm all in! I'll either use the YBF concealer palette pictured above or I'll use whatever bronzer I am using as my contour as well. Blush: I also lighten up with my blush. I used to like darker blushes on me as well, but not so much anymore. Whether it's matte or something with a glow (no glitter please!) I opt for lighter colours and a lighter dusting that is blended well. If I use a matte blush I tend to add a bit of a highlight, but when I use a blush with a glow to it I skip the highlight in the cheek area. Physicians formula makes some of my favourite blushes that blend well and add a touch of glow. Pictured below is one of my favourites (Argan Wear in Rose!) Newer Physicians Formula products like this one can usually be found not only on sale but with a high-value rebate coupon attached, look for them on packages in stores. Eyes: I would say that the most significant change in my makeup routine that has come with aging has been with my eye makeup. I definitely do a lot less and use lighter colours. I just want to lighten and brighten that area, so for everyday looks I go for colours that will do just that- lighten and brighten. On most days I'll just sweep a light dusting of a light shimmery shade all over my lid, top with a liner close to the upper lash line and add a good dose of mascara to curled lashes (top lashes only.) I'll often define the crease a little with a matte, cool-taupe or warm-brown shade. I find this gives me the most wide-eyed, bright-eyed and awake look. This has really simplified my makeup routine and that's a plus for sure! Note: Make sure to use an eyeliner that wont budge once it sets. If your upper lid droops at all ie. hooded eyelids, you will end up with liner smudges that none of us want. To test: draw a line on the back of your hand with a liner, wait a minute or so and swipe the line with your finger to see if it smudges. If it doesn't smudge, you're set! There are many drug store brands these days that don't budge or smudge. I was able to use this method to declutter my eyeliners and now I never have to worry about what I've grabbed out of my collection to use on any given day. Of course, there are still days when I want to have more fun and use more colour in my eye look- this is when I pull out some more matte shadows to incorporate into the look. I don't mind Shimmer on my lids, but I don't want to put any shimmer above my crease- this is where the matte shadows help out and will become your BFF. No one wants to highlight crepiness in the skin or on a hooded eye. If I want to use colour, I tend to use it in the form of a liner for a pop of colour. When I do go for some coloured shadows I balance it out with some earth tones mixed into the look, to make it more natural looking. eg. A green eyelid with a medium brown shade blended into the crease. Pairing a neutral shade with a coloured one should work no matter what colour you choose. Just remember to blend well so there are no harsh lines. Above: Pixi Endless Silky Eye Pen in Oysterglow/ Wet n Wild Idol Eyes in Pixie/ Annabelle Kohl eye liner in Halo (yes, all well loved!) The Pixi one stays the longest in the waterline. The Wet n Wild one is great for the inner corner highlight! Lips: In terms of lip colours, I've also lightened up. Everyone is different but as I've aged my lips are less plump, have become more lined and show signs of dehydration. 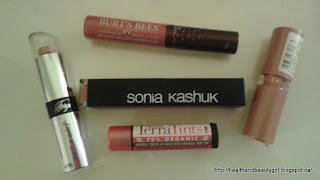 So, I opt for lighter colours that will make my lips appear more plump and youthful. I'm not so much into full-on lipstick anymore, unless it's not too opaque. I tend to stick to what works for me; nudes and light pinks or berry tones. I stay away from matte lip colours as I find that they accentuate the lines and dehydration in my lips. I find that I can never go wrong with a light baby pink colour that brings lightness and brightness to my face which makes for a more youthful appearance. Also, I find that a lip gloss can help hide lines in the lips and make them appear more plump and youthful. Sometimes a good tinted lip balm is all I need! My favourite, shown below (Alba Botanica Terra Tints in the colour Bloom) is natural, organic, moisturizing, has spf, and gives the most beautiful MLBB colour to my lips! I use this one daily, sometimes in place of a lip colour and other times just as my lip balm. It adds a nice flush of colour to my lips that seem to have lost some of their pigment with age. I also stay away from lip products with glitter, as I find that later in the day, I will surely find that the glitter has migrated all over my face- not my cuppa tea! Lighten, brighten and lift! When I use a matte blush I will often use a bit of highlight on my cheekbones to give the illusion of a lift to the face. I also like to highlight above and below the eyebrow which can also give the illusion of lifting these areas. Another common place to highlight is the inner corner of the eyes to help them appear brighter and more open. Personally, I opt for glowy highlighters, nothing with chunks of glitter as that can highlight lines and crows feet. If you don't want to purchase a highlighter, many light, shimmery eye shadows can be used to highlight the face. Go matte! If you have any texture issues with your skin, whether it be rough texture, bumps, large pores etc. try out some matte products. As much as I like a healthy glow, I don't want my whole face to glow nor do I want to "highlight" areas where I have any skin issues. This is where matte products can do wonders. Many mattifying products can help hide or diminish issues with pores and texture. 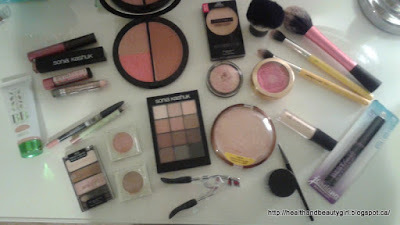 If you haven't already, try some matte powders, bronzers and blushes out and see how you like the look. Use a concealer as a dual purpose product: to hide and highlight. We all use concealers for obvious reasons- to conceal spots on our faces etc. But, I also use concealer to highlight any shadows or sunken areas in my face such as the nose to mouth lines, the corners of my mouth, and the dark inner corners of my eyes, really anywhere there is darkness or shadows where you wouldn't want them. Use some concealer to hide the shadows and bring the areas forward. Some people even use concealer for reverse contouring eg. 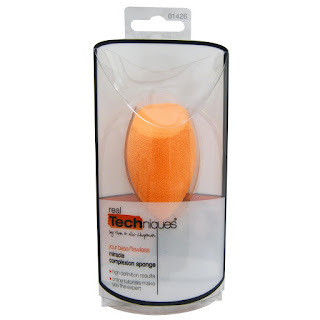 using it to highlight/ bring forth the area underneath your cheek contour. Over-lining your lips. If done well this can help make your lips appear larger than they are. Just make sure to only overdraw them slightly and to use a colour close to your natural lip colour so that there are no obvious lines. Above: Elf Kabuki Face Brush/ Real Techniques Blush Brush/ Bdellium Tools 787 (x2)- Amaaazing for crease work!! I also recommend a mirror that has a magnification side to it. This can come in handy for making sure you're getting a nice straight line with you eye liner as well as catching any stray hairs you may need to pluck! A good beauty sponge. 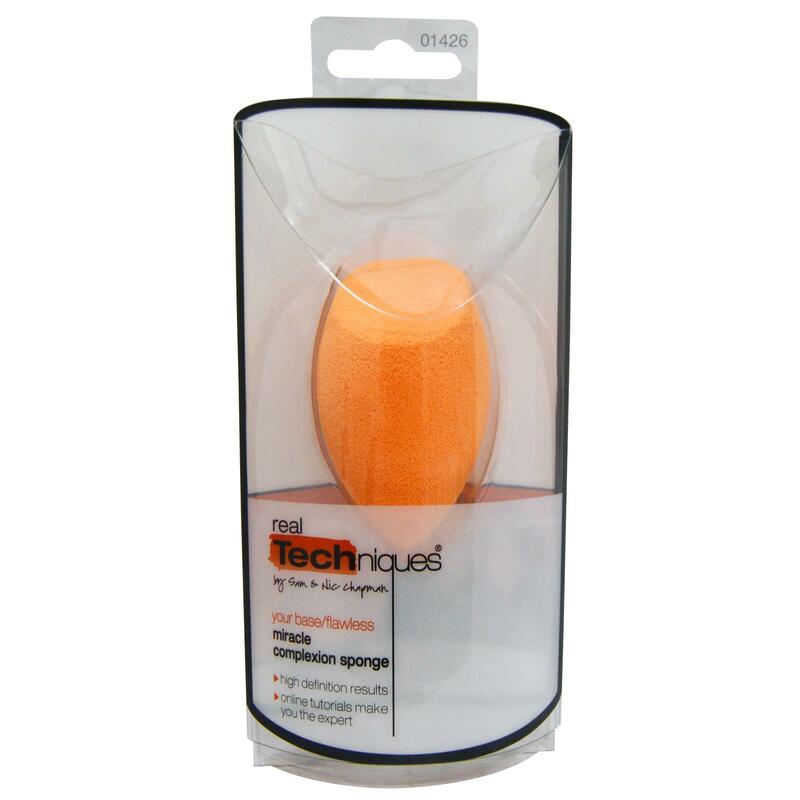 A dampened sponge goes a long way in helping to blend your foundation, BB cream or whatever you choose. It also helps to moisten the skin and avoid any dryness showing through your makeup. I love the Real Techniques Complexion Sponge. It's only $5.99 and works really well and last for a long time. Curl those lashes! Apparently, as we get older our lashes become straighter. It gives your eyes a nice lift when you curl them. Groom your brows! Even if you just use a clear mascara type of product it, brushing your brows up and outward gives your eyes a lifted look and tames any strays from sticking every which way. Who doesn't want that? And it's so easy! Whatever your putting on your face (besides your eyeliner and your lipsticks)- blend, blend, blend! Also, while doing my makeup, whether it be blush, eye shadow or highlight, I always work up and out. I want to make everything look lifted, so concentrating on your placement in an upward motion should help with this illusion. Try it if you haven't already, it works wonders! By the same token, of lightening up on my makeup, I believe in lightening my hair more as I age. Of course everyone is different, but for me lighter hair really brightens up my face and I find that darker hair enhances any shadows on my face which I find ages me. Good skin is more important to me than makeup- with good skin your need for makeup becomes less. But, as we get older it becomes more challenging to have great skin. Inevitably, time will eventually take it's toll and we will start to lose that youthful glow and plumpness that our younger skin once had. Plus, as we age our skin tends to show more discolouration and pigmentation issues as well as possible scaring from old acne etc. Good skin care is a whole other blog post, but I can't go without at least mentioning it in this post- since great skin and wearing less makeup go hand in hand, as does beauty for that matter. I'm sure there are a ton of other tips that could be added to this list. If you have any youth-a-fying makeup or beauty tips please share by commenting below, I would love to hear your tips and tricks! Thanks for stopping by and I hope you find a new tip or two to try out! Brilliant tips! All very useful for this 40+ year old!